The last three seasons brought to the elite distance ranks Paul Chelimo, soldier-athlete, breakout 5K silver medalist at the Rio Olympics—just 0.6 behind the great Mo Farah—’17 Worlds bronze medalist in another madcap dash to the line, Continental Cup 3000 champ this year. Blessed with a stride reminiscent of a thoroughbred, the Kenyan-turned-U.S.-Army-volunteer who trains with coach Scott Simmons’ American Distance Project announced after winning the USATF 5K title in New York City that he has begun a new chapter of his life. Having completed his military contract, he has left the Army and its World Class Athlete Program and signed a contract with Nike. Reaching the 28-year-old North Carolina–Greensboro alum by phone at his Colorado Springs training base in mid November, we asked about his new civilian status, origins as a runner and more. T&FN: You’ve finished your Army service and have signed a contract with Nike. How did this change come about? Chelimo: I had a 4-years-and-5-months contract with the Army and I medaled in the Olympics, I medaled at the World Championships. I mean I really loved the Army and I wish I would stay. Right now I’m just coming out of the base; I wish I would stay but it’s a lot of distractions just to train and do the necessary requirements [of Army service]. Especially, the next 5 years is really, really important because we have a World Championships, Olympics, World Championships again and then Paris 2024. So the next 5 years is really, really important and really preparing for it seriously is very, very important. Especially, Paris is going to be in Europe, Doha is close to Ethiopia and Kenya, you know. So it’s far away from the United States. Just by that, it will be easier for me [freed from Army commitments] just to travel to Kenya, stay in Kenya and just fly 4 hours into Doha for the World Championships. The best feeling ever because you don’t have to deal with the time difference. Over the years I’ve realized jetlag is a big problem so this is a situation in which I really need to focus and see what I can do now that I’m on my prime and just keep improving on my 5K time. With the military requirements it can be tough to keep improving, you know? You’re not recovering and you’re not training consistently. 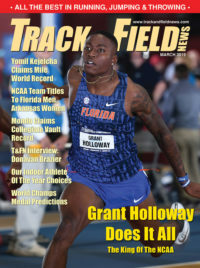 A good example would be last year at the U.S. Indoor Championships I was worried about my performance and everything because I had gone to Ft. Liggett in California for a military requirement. We were required to be there because they were opening a new military track and we were the best people to represent and be there. But then I got food poisoning a week before the championships. It was a bad situation. I’m just happy I was able to pull it through and win. It was the year that I ran 8:28 for the 2-mile. I was food poisoned and I didn’t train the whole week and still coming back and being able to get the win, it was a burden for me. So it’s been up and down. Military requirements, it’s a lot of things to do. We had to do a lot of things when I was in the military. For example, just today, they had a little practice on base and they invited me. And guess what? My teammates in WCAP are still doing some stuff. They’ve been there since 10:00 in the morning and they are still there [5 hours later]. Doing that and then getting back tomorrow and doing a workout is no joke. So that’s the type of distractions that I’m telling you: you can go on base, stay there the whole day, tomorrow you have to go and work out. Performing at the top level, you really need to get a lot of recovery and you need to have peace of mind that you have that focus. 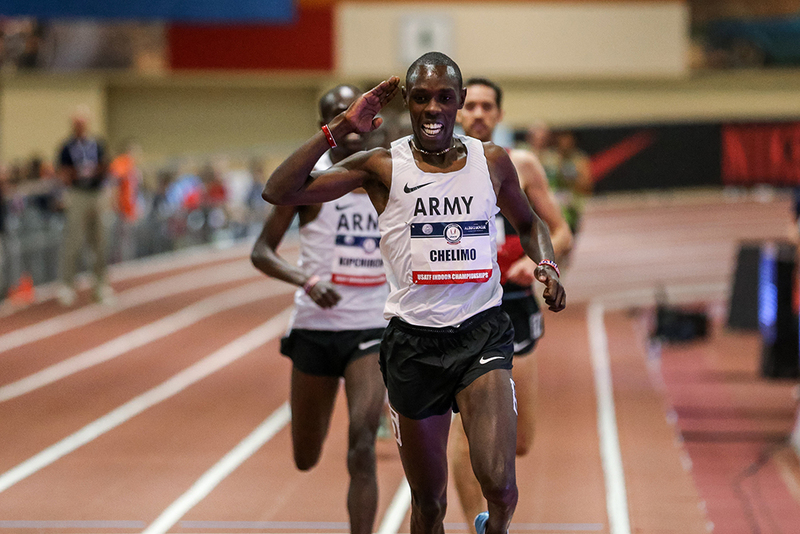 For almost 5 years, during which he developed from a promising distance man into a medal threat at any global championships Paul Chelimo balanced training and competing with his responsibilities as a serviceman. How was his time divided among his two roles? Chelimo: Usually [the Army] would call us based on the urgency but most of the times I was on base at least three times a week, depending on what the requirements were. T&FN: What was your role as a soldier? Chelimo: I was a Water Purification Specialist but I was never deployed. WCAP is for athletes trying to make the Olympics. You know track & field. If I were deployed this year, for example, trust me, count me out, I’m not going to make the Olympic team. It’s hard to get back and get back to training. Especially if you deploy to some place like Afghanistan or Iraq, you cannot do all the mileage that you need to do, you can’t run around everywhere that you want to go to, you cannot do whatever you want. That’s why they put WCAP on non-deployable status. T&FN: How did you decide to join the Army and WCAP? 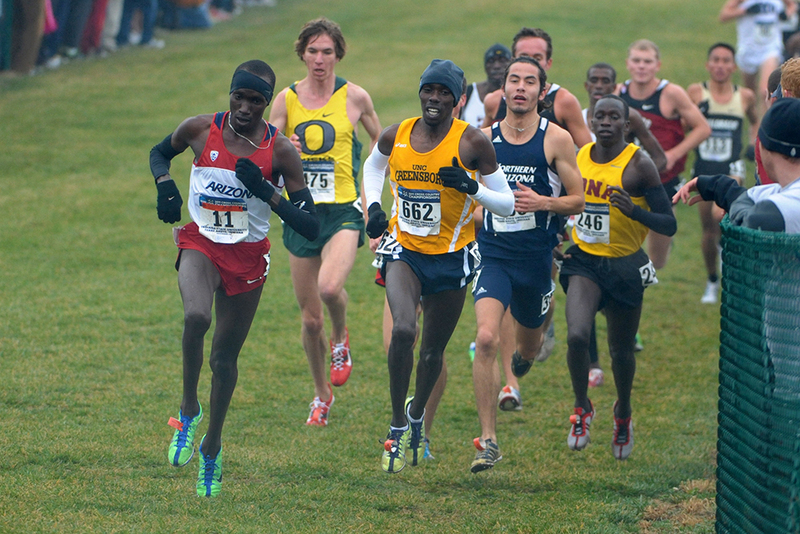 Chelimo: I went to school in the U.S., of course, for 4 years and after I was done with school—I mean I was two-time runnerup at the NCAA and I could have signed a contract anytime I wanted but I just wanted to give back to the United States. They’ve been there for me and that’s something that I don’t take for granted. When I run every time at the [USATF] Championships, I’m ready to die, I put all the effort in, and that’s how it is. I cannot take that opportunity for granted. That’s what I can say. T&FN: You opened some eyes in 2016. You had a couple runner-up finishes in NCAA 5000s in ’12 and ’13 but after you graduated from UNC Greensboro in 2013, you didn’t race on the track at all in ’14. You ran a couple road races in March and then no further competitions. What was the story there? Chelimo: Yeah, at that time I had already signed up for the Army and I was waiting for my ship-out date. So at that time I just needed to do something to keep me going, something that would make me be focused. Because it’s really easy if you don’t have races to procrastinate training. That’s why there are races. We build up to every race and so, for example, I’m building up to the Manchester Road Race, which is next week, and after Manchester I need to find a race I can build up for. Maybe the U.S. Cross Country Championships. Without races you can easily lag behind and think things are OK: “I’ll start training tomorrow,” but tomorrow never comes. And when tomorrow comes it’s too late already. T&FN: At least as a member of the American Distance Project you have a lot of great training partners to keep you honest. What is your training routine like? Chelimo: When I was with WCAP usually we would go in the morning for formations, we’d go for accountability and then meet for training. Usually we would meet for training around 9:00 in the morning. We’d do our 3M warmup, we’d do our workout and 3M cool down and then everyone goes to their homes. Easy runs are on their own and we usually meet during workouts: Tuesday, Friday and Sunday long run. T&FN: What is your long run, typically? Chelimo: Usually my long run is 16M. As a 5K guy, that’s what I need usually. If I go fast I could do 14M but usually I put in 16. T&FN: You’re in Colorado Springs. Are your runs on mountain trails or roads or what kind of terrain? Chelimo: Usually just rolling terrain, just normal trails. We do it just on trails, no mountain runs. T&FN: It snows there, obviously. What do you do when there’s snow on the ground, snow on the track? 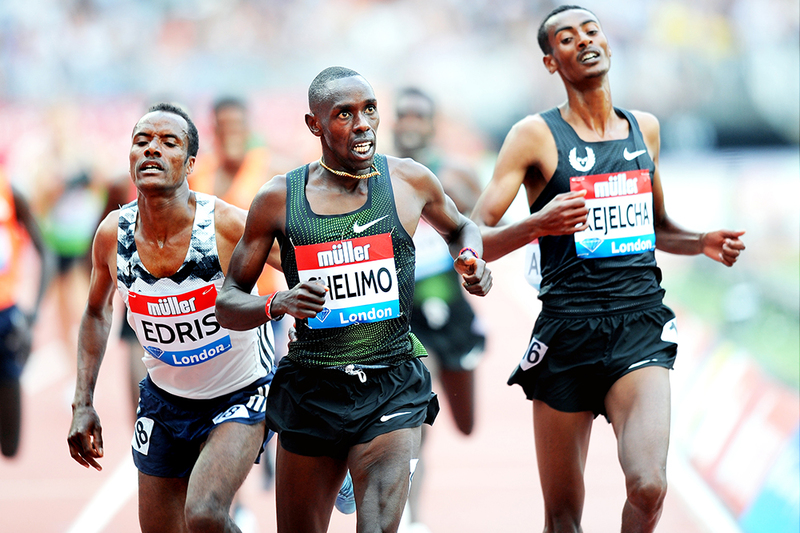 Chelimo: Usually we do our best to make sure we get a workout in. Like 2 days ago, we had a workout, fartlek, 1/1 times 30 [1 minute on, 1 minute off times 30], and we had to do it on the trails. Some places were slippery, we had to slow down. It’s tough but the best way to train is to train on the trails. Treadmill doesn’t work, especially in workouts. I don’t believe in treadmills, I never train on treadmills. Very rare because there’s a high risk of injuries. If I have the opportunity to go outside and train that’s the best bet. T&FN: How many guys do you have in the group when you do the hard workouts? Chelimo: Oh, man, the team is growing. We have at least 30 people, especially during long runs, which is really good. I don’t think these days now there’s another team that I can train with. These are people that I can relate to well and it’s lot of people; I can always have people to run fast during long runs, I can have people to run fast during workouts. When I want to go slow I have people I can run with. T&FN: Does Scott Simmons individualize the programs of all those athletes? Chelimo: It’s mostly individualized because now we have people who do marathons, we have people who do 5Ks, we have people who do 10Ks. At this time right now we usually do our workouts together because it’s off season. For example, for me right now all I need is strength, I don’t need to do a lot of speedwork so if I get to train with the marathon guys, I get the benefit still. It depends on what the coach gives us, but mostly we break the workouts down into groups when we’re in our own season. My type of training for the 5K is kind of like 1500m training in the perspective that the pace is fast, you know? So I have teammates but it’s different. Sometimes I find myself doing my own workouts by myself because it can be intense sometimes. T&FN: How did you become a runner? T&FN: How old was that superpowered Paul Chelimo? Chelimo: I was about 10. T&FN: Do you remember your first race? Chelimo: My first race I ran when I was in middle school and it wasn’t a good experience. Running on a dirt track, barefoot, and they didn’t have the usual timing mats and everything that we are privileged to have in the U.S. The deal was once you get lapped, you step off the track. T&FN: What was the distance? Chelimo: It was a 5K. But I was still young then and I never trained for it that well, and I was just doing it to represent my school. I wasn’t training for it. Unfortunately, I got lapped at lap 8. Chelimo. I had to step off the track and since then it’s been a journey. There was a time my Mom knew I was talented she took me to a training camp, you know Brother Colm, St. Patrick’s [High School]? T&FN: Of course, legendary font of Kenyan world beaters. Chelimo: That was my first day of training and they threw me to the wolves. I just showed up the first day, no easy run, nothing. They said, “We’re doing a workout today,” and I jumped into the workout. I jumped into the workout and at that time my shoes weren’t fitting well because I’d just gone to the market and bought some secondhand shoes. The shoes were not fitting my feet well and there you go. I remember that day there was [David] Rudisha and Isaac Songok [a 3:30.99, 7:28.72, 12:48.66 runner], and Augustine Choge was there. We did a run, I wasn’t fit yet, I didn’t do any easy runs, I didn’t do anything. It was just my first day to go into training. And at that time I was struggling because the shoes were really hard on me, they were tight on my legs. They were tight, they were small on me, but I didn’t realize because they were new shoes. I woke up, I was excited, they were fitting. As long as they were fitting I was fine but then they were a bit tight because once you start running and your body gets warmed up, it gets hot and maybe the feet expand. It just became really uncomfortable. And they were even not running shoes. I think they were walking shoes, just walking sports shoes. I just ran all the way back. When I got there, people had already taken a shower, they were getting their food, they were eating, and nobody knows who Paul Chelimo is. There were no coaches, there was no one, and I really got heartbroken. I was about to literally cry because I went there and I’m new, it’s my first day, nobody was there to give me breakfast. So I just looked at the athletes, and everyone was doing his own thing. I just turned around and went back home, I lived like a mile from St. Patrick’s so I just walked back home. And guess what? That was it. I’ve never run since then. T&FN: We know you tried running again at some point. Chelimo: I started running after high school. That was 2010 and this is 2018. Eight years down the line and I’m here, I’m very strong and already I’ve achieved a lot, and I always say if I ever go back [to St. Patrick’s], I want to go back there and call revenge. But that would be really childish if I were to go back and try for revenge because the people that were there, most of them, they’ve burnt out or maybe they’ve stopped training. David Rudisha doesn’t do the same things anymore. Pretty much the only guy I know who I could go duke it out with is Augustine Choge but Augustine Choge has moved to the marathon and he’s training now in Kaptagat so it’s different. T&FN: At the Rio Olympics, you PRed twice, going under 13:20 for the first time in your heat (13:19.54) and running 13:03.90 taking silver in the final. At this year’s Diamond League Final in Brussels you dropped your first sub-13 race (12:57.55). But you placed 6th in the race. Thoughts on that? Chelimo: I’m just happy with the way the year ended, breaking 13:00 and being a Continental champion. It’s been a great year. My big goal was to win the Diamond League final but then just breaking 13:00—If I didn’t break 13:00 in that race, I would be very, very mad at myself until today. But it’s a bittersweet situation. As soon as I crossed the finishing line I knew I’d broken 13, but just being 6th place was not what I wanted. I just appreciate that I broke 13:00. It’s a new territory that I’m in right now. Currently it’s not easy to find a sub-13 5K runner so I’m just privileged to be one of them. T&FN: What goal inspires you the most? Chelimo: The way I’ve been improving in the 5K, I’m even surprised. It’s very crazy. I started at 15:09. I can even remember the graph of how I’ve been improving all the years. My first 5K was 15:09 as soon as I started training and since then before I broke 14:00 it took some time, and now I’ve broken 13. My first year running in the NAIA we had a “great goal” and a “big goal.” My great goal was to break 13:05. I’ve surprised myself. I’m now about 8 seconds faster. So definitely over the years I have to run 12:45. That’s my next big goal. Before I get to 12:45, I just want to break the American Record in the 5K first [Bernard Lagat’s 12:53.60] and then go dip toward 12:45. I know that running 12:45 is never going to happen without first stepping into 12:50 territory. I have to come down to 12:50 and then 12:45 because it’s taken me 8 years to improve all the way from 15:09 to 12:57. I know how my body reacts, I know how I’ve been improving, and I know how much I can improve. I’ll just go the longest way, I don’t want to take shortcuts. You have to build your body to get where it is. Once you build it, it’s easier to maintain there. Once you take it there quick, it’s easy to break down and be done. So breaking 13:00 is big because when I broke 14 I had to play around 14:05, 14:02, 14:01, 14:01, 14:01 and then I finally broke it. So now that I’ve broken 13 it’s not a hard thing to do again. So if I keep improving, if I get the times around 12:45, it’s not impossible to break the World Record because my body at that point would have told me it’s possible. T&FN: Anyway, you ran a few races in high school but didn’t train until after you had graduated. How did you find your way to Shorter College [Rome, Georgia] and then UNC Greensboro? I went there, I did the race, it was terrible. For 2.5K I was with the leaders, with the guys, just from my fitness. I had not done a workout for like a week because I was doing farm work. In this situation I didn’t want to spoil my name and make it look like I’m not an athlete, you know? So I just had to drop out. I went there hoping my body would feel good, hoping I would run fast, but then it wasn’t going to happen. Because if you go to the farm from like 7:00 in the morning until like 3:00 p.m. just doing farm work the whole day, you’re not going to expect to run fast. I wasn’t recovered well and I wasn’t ready for it. I eventually dropped out. And this guy [Bawcom’s husband] called me aside when I was taking lunch. I was like, “Huh? Of all the people, you just saw me and I didn’t even finish the race.” They knew I was talented because I tried my first 5K and I ran 15:09, my second 5K I ran 14:54, and then the third 5K I ran 14:45—all of them at altitude. So this guy, I think already he had my times in my races, and so it was that easy. As soon as we talked, he looked at me and he coaches Janet Bawcom so he knows what type of an athlete this guy’s gonna be. So that was the day and we started paperwork and 4 months later I was in the U.S.
T&FN: You later transferred to UNC Greensboro because you wanted to test yourself against NCAA competition? Chelimo: For sure. My first year I got 3rd place at [NAIA] Cross Country. The next season on the track I won the 3K indoors and I helped my team win the DMR, and then we won the national title for that year indoors. Then outdoors I was in really good shape and I won the 10K and the 5K at the NAIA National Championships. So already at that point a lot of coaches were talking to me and I was [having success] in the NAIA, so I just wanted to do something that was going to help me in the future and improve my running. I just had to move to a D-1 school and I knew one of the guys at UNC Greensboro. His name is Paul Katam, and I just found myself there. T&FN: What was your major at UNCG? T&FN: Ah, OK. Switching gears slightly, what race are you most proud of from your career so far? Chelimo: Definitely it’s the Rio Olympics. The Olympics in Rio changed my life, the Olympics in Rio was everything. That race, every time I think about it I just know that’s what made my life better. T&FN: In that race, at the ’17 World Championships, even at the USATF 5K road champs this month, you’ve had some rough-and-tumble, limb-tangling close finishes. How has that come about? Chelimo: Yeah. You know the 5K is very tactical, and when three or four people finish at the same time, 52 seconds for the last 400, it comes down to mental toughness. It’s been tough all the years. Because since Mo [Farah] moved to the marathon everyone wants to take over, you know? So it’s very, very intense. T&FN: At the Birmingham DL in August you ran a mile PR, 3:55.96. Do you have any aspirations as a miler? Chelimo: I’m going to do the Camel City Mile in January and I know Matt Centrowitz and Edward Cheserek are doing it. Today they just announced a really good pacesetter [Craig Nowak] so it’s gonna be a big race. I want to race with Centro and Edward in Camel City because I consider that as my hometown since I went to school at UNC Greensboro. And I was the first guy to run on that track and I have a lot of fans there. They know me and it’s going to be big for me to go back there and duke it out in the mile. If I win it, it’s going to be really big. If I don’t win it, at least I’m gonna show up. T&FN: Do you plan to run a full indoor season with the World Championships falling so late in the year? Chelimo: Yeah, it’s very complex, this year is very complicated. But I think the best bet is just to train smart. I will make sure I train smart and make sure I progress as time goes by. The guy that is going to win the World Championships 5K is the smartest guy. It’s not the guy who trains harder than everyone else, it’s the smartest guy who’s going to win it. Because October is way, way far away so we have to train smart and prepare for it. T&FN: Athletes at both the Doha Worlds and Tokyo Olympics are almost certain to encounter very hot weather. Chelimo: The hotter, the better for me. That’s the thing for me. Doha’s going to be my best type of weather. T&FN: You’ve had a busy life as a soldier/athlete. When you have some free time, how do you like to spend it? Chelimo: I usually play a lot of FIFA with friends, but I guess that’s going to go away soon because my wife is expecting a baby girl and that’s going to be another responsibility, taking care of the baby, taking care of the family. Most of my free time, I’ll be spending it with the baby. T&FN: Congratulations. When will your daughter be born? Chelimo: Thanks, I appreciate it. She’s due in December. T&FN: So apart from that big life change, is there anything you anticipated doing differently in your training or anything you plan to emphasize in your preparation for the years ahead? Chelimo: Yeah, I just want to get more strength. To run 12:45 is going to take a lot of strength. I’ll just take my time and build up as time goes by. No rush, no pressure. I’ll just go slow as time goes by. The big thing is strength and the other things will take care of themselves. T&FN: Patience seems to have worked for you so far. It sounds like you enjoy training. Chelimo: Yes, definitely. I’m very passionate about running. It’s something that, no matter what, even if I’m not a champion, even if I don’t make any money out of it, even if I don’t do anything, I’ll still be running and be doing my best in it.